I gotta tell you, I’ve never really tried stuffing meat before. I’ve ordered stuff like this in restaurants, because it seems so fancy, and it’s always so delicious! So I figured, hey why not go outside my bubble a little and try this recipe myself! Also, I’ve been missing my date nights with Cary. He works on a cruise ship as a musician and he’s been gone for like 4 months now, ugh! The first 3 months I was doing ok, just keeping busy with work, creating new recipes for you guys, trying out a new Yoga class, taking some Salsa lessons, and driving my son around to various activities. I figure if I stay busy enough it’ll take my mind off of Cary being gone. Well it only works temporarily. I think this week I hit a wall. Just feeling blah and missing him like crazy. This was really simple to make too! So if you’re looking to have a ‘date night’ dinner at home, or just a great meal with your family, give this a try! First I just sautéed some baby spinach and garlic for a few minutes. Then carefully butterfly the chicken breasts making sure you don’t cut all the way through. 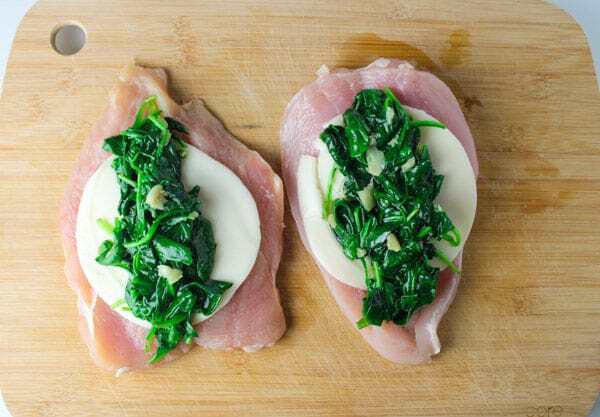 Then just place a slice of Provolone Cheese over each piece of chicken and top with the spinach. Gently fold the chicken over in half and make sure everything is stuffed nicely inside. Bake it up, and Yum Yum Yum! Soooo Delicious! If you like this recipe, try my new Prosciutto Wrapped Chicken Stuffed with Brie and Rosemary!! Sprinkle top of chicken with paprika. 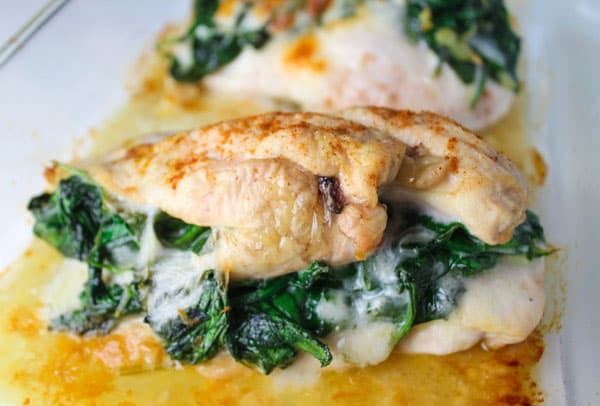 Can the baked spinach provolone chicken breast be frozen? Lol, I meant can you freeze left overs or batch cook and freeze? Thanks! I make them up ahead of time and freeze before cooking, saves a lot of time and still taste great. Turned out great ….used fiesta cheese n garlic salt n mrs dash onion. Mix….with spagetti. N garlic bread..hibby loved. It…thanks. Yes, if all the ingredients are fresh. Yes Erin, if all the ingredients are fresh. Hi can you use any other greens like collard, turnip, mustard etc. I don’t eat spinach like that but it looks amazing. Looks great I’m gonna make this ! I made this for dinner tonight. Oh my gosh…so delicious and so very easy. I did add a little dried basil and rosemary to the spinach. My husband says thank you 100 times for posting this recipe. I also made this with my own little ‘twists’ a couple of times! The first time I just added some halved grape-tomatoes to the spinach (do not sauté the tomatoes…add when stuffing the chicken breasts and then bake as usual). Gives it a somewhat ‘bruschetta’ taste. Delicious!! The second time, I added basil and some other Italian seasonings when I sautéed the spinach as well as scallions, stuffed the chicken breasts and then battered them twice using Italian bread crumbs topped them with mozzarella and baked as per usual. NOTHING but scrumptious feedback from the family! Ps. I’ve also thought of adding just a bit of ginger root to see what kind of ‘twist’ that might add! I’m making this for dinner tonight I’ll let you know how it turns out. But I looks good anyways. 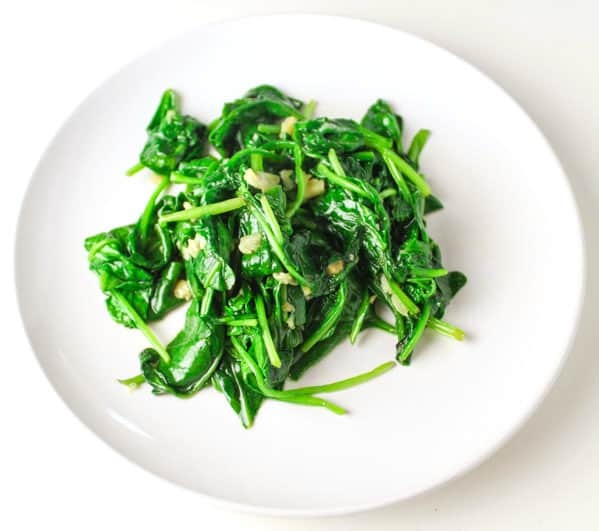 Can frozen spinach (thawed) be used? Yes, but thawed and dried. Did you baked this covered or uncovered? So glad you all loved it, Anna-Marie! Made this tonight, hubby and I both loved it! I also added fresh diced tomatoes and some Italian seasoning inside. Thanks for the recipe! My store had a sale on boneless skinless tenders instead of breasts, so I think I will try this as more of a layered dish! Can hardly wait! That’s awesome Sandi, let me know how it turns out! What other kind of cheese can I use if u don’t have provolone? You can use any kind of cheese…but I recommend Provolone, it gives it such an amazing flavor! You’re welcome Karon, so glad to hear it! So I made three: One left alone and made as per recipe instructions, one with grated parmesan cheese sprinkled on top (added when there was ten minutes left), and the third with parmean and some balsamic glaze. All variants were great, and I’ll be making it again (might add some balsamic to the spinach mix next time and see what happens). That sounds great Sandra, love the variety! This was delish!! we added a baked potato to it, really yum!!!! Thanks Niki, glad you liked it! I was wondering, can you defrost the chicken prep amd refeeeze? Would love to hear anyone’s comments. Defrosting the chicken, prepping and refreezing is not something I would recommend, due to the bacteria developing once thawed and prepped. Even if thawed in the refrigerator, I would be very wary of using that process, as the risks involved seem a bit to high in regards to the time saved. A safer option would be to buy chicken that is not frozen, prep, then freeze that. That said, this is a great recipe, and very delicious. It leaves a lot of room to play around with it, but is quite nice as is. hello when you put the chicken in the oven dish you don”t put any liquid in the dish?so it won”t get stuck to the dish? The serving size for this recipe is for 2 people. A rice pilaf and asparagus go very nicely and make do a very healthy meal! I used boneless chicken thighs cause we like dark meat. So smaller portions but most definitely a keeper. Thanks Kerri, so glad you both liked it! Hi Krystle, The nutritional information is posted underneath the recipe for you to decide if this fits into your diet, if you’re unsure of something you can always consult your physician. I don’t like cooked spinach so I wonder if there another vegetable I can use in its place? This is one of the easiest low carb recipes I have seen. I’m single and don’t like cooking just for me, especially after a long work day. This seems so quick & easy that I can see making it even during the week. Hey Lynn, some of the people in the comments above said they used Basil and Tomatoes, I think that would be delish! Made this with pork chops instead of chicken breasts. It turned out super yummy!!!! Will definitely be adding this to our weekly meal plan. Thanks for sharing! Oooohhhh that sounds good Dana! I made this last night and it is delicious! 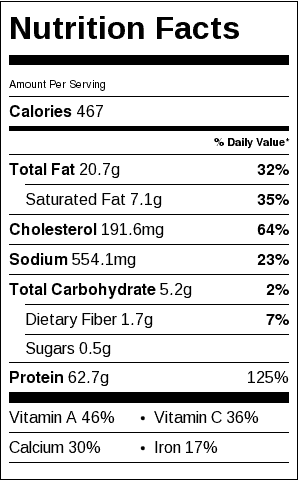 Just wondering what is considered one serving for the nutritional information? Is that 2 prepared chicken breasts? Can the garlic be substituted for another ingredient? I made this last week and loved it!!!! Thanks Diana, so glad you enjoyed it! I tried this last night, and we loved it! Once it was cooked I added sauteed mushrooms + grated parmesan and baked an additional 5 minutes (because I can eat mushrooms on almost everything). Will definitely be making again. It’s perfectly filling without feeling like you gained 10lbs. What temp do you cook this on and for how long? Can’t wait to try!!! I want to try, but why don’t you season the chicken with salt and pepper? I’m wondering how it will taste with no seasoning. Do you salt the chicken? I don’t see that in the recipe anywhere Thanks! Made the chicken for my meal prep and I can’t wait to taste it. Easy recipe thanks for posting it! With a few little add ons this was DELICIOUS. I used 2 pc of thin sliced chicken breast instead of a wbole breast butterflied cut. I am hispanic so seasoning is everything. I seasoned the chicken with a little bit salt, onion and garlic powder. Once everything was layered, I sprinkled some black pepper and paprika. Luckily, I only made one, otherwise……. ,? ? Asparagus instead of spinach is great to. Or even colorful peppers. That sounds good Dianne! Did you pre cook the Asparagus or Peppers? Just ran across this recipes. Everyone loved it. Easy prep and cook for a weekday meal. Thank you. Awesome Denise, so glad you all liked it! Made this for dinner tonight. DELICIOUS!! This recipe was on point. I added pesto sauce too. Yum! Simple recipe. Very tasty. The whole family loves it. Added pesto to one. Delish! This was my first time ever making stuffed chicken before and it came out delicious!! I added some sautéed onions as well with the spinach and garlic, I would say that mushrooms would be a good touch too!! How much of an onion? Half? 1/4? Made this last night. Very easy. Sautéed fresh spinach, stuffed the chicken and placed back in the same oven safe skillet and baked. All about the easy clean up! Delicious,will make again. This sounds so delicious and easy! Definitely trying this tomorrow… Would it still taste good with any other supermarket-bought-sandwich-cheese? Making this tonight for my wife and I as were starting our low carb diet. Looks like a fun recipe to play around with! Hey Tim, That’s awesome! Yes so many variations you could do to this! Ok, it was fantastic and easy. Threw in broccoli and mushrooms halfway through and parm over the top. Delish! Tonight were doing it with mozzarella tomato and basil! Made it tonight with parmesan and mozzarella and some bacon sprinkles. Oh boy, my boyfriend just about proposed once he had a bite. He can’t stop talking about this chicken. I’m looking at all the fun twists people have mentioned in the comments and I’m definitely going to make this again- and soon! Can this be baked at a lower temp, i.e. 375? If so, for how long? I want to make this for company later in the week and my sides need to bake at a lower temp than 425. Hi Michele, I would cook it at least 45 minutes at the temp you’re suggesting. Just make sure the minimum internal temperature of the chicken breast is 165 °F. Ooh, that sounds really good Megan! Hi sara, i want to freeze some chicken n fish for my hubby as i m going to home country for a month and hubby is on diet.please guide me how should i make salmon fish n chicken in different ways to freez.As ur recepies r very simple n easy to make. Hi Ayesha, I do not freeze all of my recipes so I cannot answer this question. Please use your best judgment for freezing and reheating. Hi after I prepared everything I didn’t see that the spinach was cooked before hand. Will it still taste the same?? Sorry I’m a complete noob at baking… What temperature do I set the oven to ? I’m terrified the chicken will turn into a rubber sheet. This is just too healthy. Lol. I just had to drizzle them with a creamy white wine sauce. Delicious! My husband and I did not enjoy this recipe at all, which is really disappointing because it looked SO absolutely delicious but turned out really tasteless 🙁 I even used more spices, garlic, and a dash more salt, but still to no avail. We are currently counting heavily on sun dried tomato pesto to save our taste buds while not letting the food go to waste. My oven is very hot when baking anything. I would like to bake this recipe at 350° for 40 minutes. The chicken seems to be more tender. My husband absolutely loved this recipe. In fact, I’m making it for the third time. I would like to drop by and say how awesome this recipe is. The first try, since I didn’t have provolone, I used mozarella cheese instead and it turned out great. I bought provolone the second time and it was equally yummy. So easy yet so delish. I found this recipe on Pinterest and bought both Provolone and Havarti to try it out! Full disclosure: I’m a vegetarian who enjoys cooking meat, but don’t care for it, so never taste it (born and raised veg). I rely on the feedback of others. I meant to look through comments because it helps to tweak the recipe before you try it, but then had an interruption and forgot! I came back and read them after dinner and thought it was interesting to note the comments about seasoning. I made it for two adults and a 16-year old. One adult thought it was good, the other went to the cupboard and got the salt. The 16-year old boy just scarfed it down! So it seems to be pretty split. If you like salt and other seasonings, you might want to salt the filleted chicken breast before adding cheese and spinach. The consensus all around was that it would have benefited from more cheese so next time perhaps I’ll do two slices (perhaps the slices I bought were thin) and just a bit of seasoning. It was also proposed to add the second slice of cheese to the top (as the picture seemed to suggest). I was puzzled by one thing. I cooked it for the suggested 30 minutes at 425 degrees but at the end of the time, it was still very pale looking (the meat-eaters thought it looked anemic), not browned. I added 5 minutes to the timer, then broiled it for another two. I think I may have dried it out too much. Suggestions? We’re in Colorado so elevation, perhaps? I will definitely make it again! Sorry so wordy! This dish is amazing. I’ve made it several times for hubby and myself. It has to be one of my favorite chicken dishes. Not only is it so easy but it tastes like something you would get at a 5 star restaurant. I’ve made it for company and got only rave reviews. I’ll be cooking this for my sons family and can’t wait for them to taste it. Thank you for sharing. My mouth is watering just thinking of it!!! 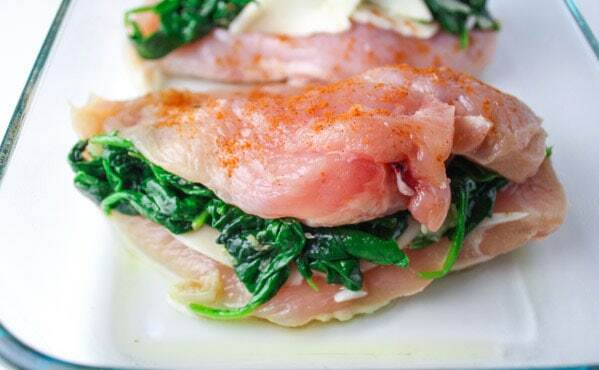 Baked Spinach Provolone Chicken Breasts! was always a staple for dinner. 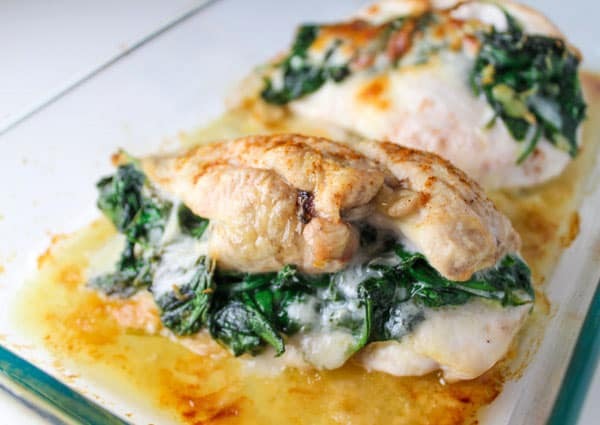 I remember how much my grandma loved her Baked Spinach Provolone Chicken Breasts! She’d make it for dinner at least once a month, and the family would come running. 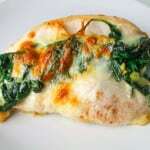 What’s not to love?Baked Spinach Provolone Chicken Breasts! and chicken is pretty much the bomb diggity of chicken. Looks amazing! I’d like to try this in my new Insta Pot..probably after the holidays! Hi Alaine, If you try this in your Instant Pot let us know how it works out! Cheers! Made this tonight. Easy & healthy but I agree with those who recommend more seasoning. Next time I will try to add the tomatoes, onion with some salt. Tried this recipe for dinner tonight. Added a little extra seasoning to the meat, but it was delicious!!! Thank you so much for sharing!! I will definitely be trying some of your other recipes! Thanks again!!! Do you think this recipe would work with feta cheese instead of the provolone? I tried this tonight and it was AWESOME!! But the Texan in me added one Zumo Sausage Chopped very small, I saute it with the spinach and added some peppers it was Amazing!…and it was a hit with my family . Oh, the side was red potatoes saute in butter and a little Olive Oil with onions also. This is one of my go-to recipes to make sure I chock as many veggies in my family as I possibly can. I add sub dried tomatoes, lemon zest, and basil to the sautéed spinach mixture. Serve with another veg or a salad and this dinner is a hit. Thank you! That sounds great Kristin, I’ll have to give this combo a try! I thought I had provolone in the fridge. I did not! So, I combined some Muenster and Gouda with thin slices of fresh parmesan. I added a bit of fresh parsley and onion to the spinach sauté. I’ll let you know how it goes. That sounds super good Tom, let me know how it turns out! It was good! Different but good! I like changing things up. I am trying low carb and fasting for lent. Grew up in my Italian grandmother’s kitchen. People ask me for recipes but I do her stuff by feels. Can I use thin chicken breasts then top with provolone, spinach and bake? So no chicken breast on top to make it ‘stuffed’? If so, how long would I cook and at what Temp? Hey Marla, Depending on how thin your Chicken Breasts are will depend on cook time. Check for doneness after 10-15 minutes and eyeball it from there. I’m not sure if you will get the same results with the cheese and spinach on top of the chicken though, I’m thinking the cheese may get burnt. If you do try this method, let me know the results! Delicious! Doubled recipe! Added diced onions to garlic and spinach stuffing! Definitely a keeper! Thanks for sharing! Can’t wait to try this tonight! Don’t have provolone cheese but will be using mozarrella and hoping for the best lol. So simple to prepare yet so good! Added a little prepared pesto, sliced mushrooms and sliced tomatoes to my filling , thank you for simplifying an excellent way to cook chicken breasts! If I use frozen spinach do I still need to cook it in a pan after I thaw and dry it? Hi Brittany, I don’t think you would need to. Let me know how it turns out that way! There’s alot of water after cooking for 30 mins – is this normal? What would you pair with this dish? Pasta or potatoes and what type of vegetable? Tried this a couple weeks ago and loved it! Made it again tonight! This time, I added shallots and chopped mushrooms to the spinach- as well as (believe it or not) a pinch of nutmeg, which was a delicious touch and brought all the flavors together nicely. I see the recipe is set for 2 servings..now if I have to make 4 servings to feed everyone, obviously I would double the ingredients to have enough but would I also double the cooking time or leave everything the way that it is? I apologize if this question is a bit asinine but I would just love to make it right!